Sarah here!! How ya doing? I’m a little spread thin, I swear. Today, I have Girl Scouts. Second to last official meeting for that. I’m both sad and excited. After that, we have one more meeting, and THREE trips. I’m sadly only going on one of those. But Madison (my daughter) is going on all three. I’m excited for her. Speaking of children (and excitement), and part of the reason I’m just spread out so thinly: March 17. Y’all know it as St. Patrick’s Day. Well, we know it as Oh Crap! He’s Aging Up! AKA, my son Ethan’s birthday. This year, he turned SEVEN. To celebrate, we bought a new car. 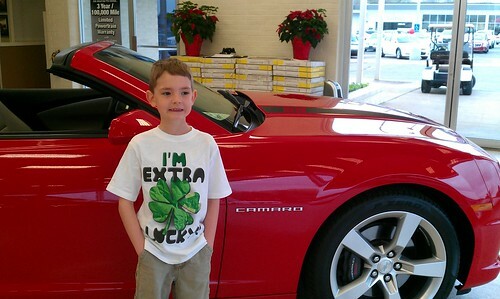 Okay, that wasn’t really a celebration, but he got to see a Camaro, which made him happy, I think.